You don't have to be an expert in exterior design to realise that the outside of a B&B is as important as the inside and if you are doing a property conversion then it's crucial to pay attention to kerb appeal. This is true for any commercial property but even more so for a B&B as, particularly in tourist areas with lots of competition, it's the inviting look of the property as people drive past that will draw them in. Many of these things help your customers to find you and create a good first impression. As well as communicating all that information the signs need to look good too, so you can see why the services of a good signwriter or graphic artist could be a good investment. Once the signs are up, attend to the general exterior design of the property. If you are doing a property conversion to create a B&B from an ordinary house, design it from the start so that the new extensions, windows and doors blend in with the rest of the property. This creates a harmonious look rather than a higgledy-piggledy mish-mash of add-ons. 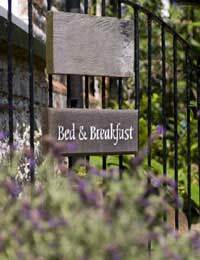 If your property is already set up as a B&B take a critical eye to the exterior decoration. Make sure that the fabric of the house is in good condition and renew the paintwork regularly, before it gets dowdy. By doing this you will also find other problems, and you can then fix them before they get critical and start to drag the tone of the B&B down. After the building work of a property conversion is finished it would be very unwise to neglect the garden and the approach to the house, as landscaping is an important part of exterior design. As an absolute minimum the paths should be swept, the lawn regularly mowed and the garden generally free of weeds and tidy. It's probably worth taking it a step further and trying to visualise the exterior with the fresh eyes of a customer. Approach the property both on foot and in a car, from all directions, and try and note the impressions you get. Is a tree hiding pleasant architectural details? Is the path to the front door obvious and clearly marked? Could you lead the guests' eyes with better planting? Finally the B&B entrance is the first thing that customers see once they arrive, possibly after a difficult journey, so this needs attention as part of the exterior design too. If you have a porch with a door and a separate front door then make sure they are easy to open and swing easily, the last thing you want to do is give your new arrivals a hernia! Keep fresh flowers in the hall but make sure they aren't in danger of being knocked off by tired guests swinging large bags. The flooring should be non-slip and be able to cope with water and dirt when guests arrive in bad weather. And try and fit in coat hooks or cupboards, and an umbrella stand, so that guests don't have to traipse water all the way through to the bedrooms.